You don't need to spend a bundle to keep your home safe from environmental and man-made hazards. All it takes is knowledge of what can go wrong, and a few simple steps to prepare yourself. Being prepared to act when an accident or a fire occurs, and having the necessary detectors in good working order, will help you rest easier at night. The following 4 tips for a safe home will help ensure your home, sweet home, is home, safe home. 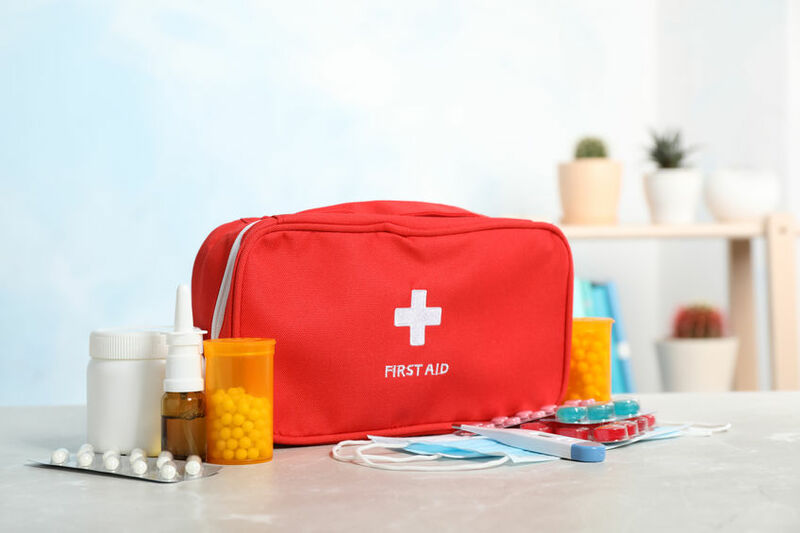 Because accidents happen, you'll want to be prepared to treat scrapes, burns, bites, and other minor and major mishaps that may occur at home. And be sure to keep the phone numbers of your nearest poison-control center, your pharmacy, and family members' doctors in your cell phone. Because the toxic gases from a fire could keep you from waking up should a fire ignite while you're sleeping, maintaining working smoke detectors for every level of your home is a must. Install smoke detectors on the ceiling (smoke rises) in every bedroom and outside bedroom doors, at the top of the stairways, and in any den or office in the basement. Test the devices monthly and replace the batteries at least once a year. Fire extinguishers should also be kept on each floor as well as in every bedroom and in any room where a fire could occur, such as the kitchen or a workshop. Check fire extinguishers monthly - it could keep a small mishap from becoming a disaster. Another safety must-have is a carbon monoxide detector. This deadly, colorless, odorless gas is becoming a threat in more and more of today's energy-efficient and airtight homes. The source of carbon monoxide is usually faulty burning in, or poor venting of, a furnace or another appliance. Your first defense is to maintain these items properly. Carbon-monoxide detectors, which resemble smoke alarms, are an essential backup. If your home was built before 1978, it may contain asbestos around furnaces, pipes, heat ducts, and boilers; in the adhesive and backing beneath your linoleum floor; and in "cottage-cheese" ceilings. The dust of this carcinogen can cause serious lung ailments when inhaled. If the asbestos is in your garage near the furnace and you rarely go there, you should simply be aware of it and regularly check its condition. Asbestos generally is not a problem unless it's disturbed (by a leak in the roof or a child's bouncing ball, for example). If it's crumbling or otherwise in poor condition, hire a licensed contractor experienced in asbestos removal to seal it, repair it, or get it out of your home. Lead paint, commonly found in homes that were built before 1980, has also made today's environmental dishonor roll. Lead-tainted dust can escape during cleaning, and if enough of this substance is ingested or inhaled, it can cause permanent brain damage and other serious harm, especially to children, mothers-to-be, and older adults. If you live in an older home, you might want to hire a trained professional to conduct a hazard assessment. To check for lead yourself, chip off bit of suspect paint - right down to there wood, and use an inexpensive home lead-test kit. If you do find lead, cover the area with wallpaper, paneling, or new lead-free paint, and frequently wash children's hands and faces as well as toys and pacifiers to reduce their exposure to dust containing lead. The second leading cause of lung cancer, radioactive radon gas, is a serious environmental threat in many parts of the world. Typically, this odorless element moves up through the soil and seeps into buildings through cracks and pores in the foundation and through gaps in floors. Since it is odorless and colorless, how do you know if you have it? The easiest way to put your mind at ease and ensure the air inside your home is safe is through an at home radon gas test kit . Best of all, these test kits are highly accurate and easy to use, and they will help ensure you have a safe home. Shop recommended products for home safety.